In what has been described as “the crime wave no one talks about,” billions of dollars worth of wages are stolen from millions of workers in the United States every year—a grand theft that exceeds every other larceny category. Even the Economic Policy Foundation, a business-funded think tank, has estimated that companies annually steal an incredible $19 billion in unpaid overtime. The scope of these abuses is staggering, but activists, unions, and policy makers—along with everyday Americans in congregations and towns across the country—have begun to take notice. 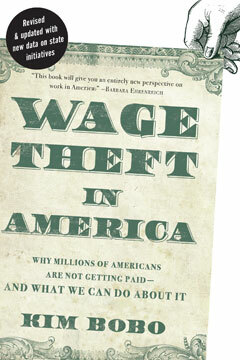 While the first edition of Wage Theft in America documented the scope of the problem, this new edition adds the latest research on wage theft and tells what community, religious, and labor activists are now doing to address the crisis—from passing state and local wage-theft bills to establishing mayoral task forces and tapping agencies that help low-wage workers in spotting wage theft. Offering a sweeping analysis of the crisis, citing hard-hitting statistics and heartbreaking first-person accounts of exploitation at the hands of employers, this new and updated edition of Wage Theft in America offers concrete solutions and a road map& for putting an end to this insidious practice. The New Press is a nonprofit public-interest book publisher. Your gift will support The New Press in continuing to leverage books for social change. Please make a tax-deductible donation today! Stay connected! Sign up to receive newsletters and event invitations. This confirms that you are a human visitor and prevents spam. It is not case-sensitive.